The Aerial Imaging and Mapping group (AIM), at the U.S. Geological Survey Woods (USGS) Hole Coastal and Marine Science Center provides UAS services to scientists to advance the science mission of the Coastal and Marine Geology Program. Scientists at the Woods Hole Coastal and Marine Science Center have been using UASs to acquire imagery of coastal and wetland environments, which is then used to produce detailed topographic and visual reflectance datasets. UAS technology is used to support the work of geologists, engineers, physical scientists, geographers, and geochemists who study coastal erosion, sediment transport and storm response, habitat classification, biomass mapping, and marsh stability. Unmanned aerial system (UAS) technology provides a rapid and low-cost solution for mapping coastal environments and assessing short- and long-term changes. The interdisciplinary nature of the data collected and the breadth of applications makes UAS technology applicable to multiple scientific investigations. One of the primary science applications for UASs is mapping. Drones can make accurate maps by combining images, which can be interpolated into three-dimensional imagery with software that utilizes photogrammetric techniques to form orthomosaics and digital surface models. Using control points on the ground, these maps can be produced with horizontal resolutions of 5 to 10 centimeters (cm) and vertical precision within 8 cm, precision is measured compared with independent measurements from global navigation satellite system equipment with real-time kinematic positioning (RTK). The maps created with drone-acquired imagery are comparable in quality with images from light detection and ranging (lidar) surveys with color processing but can be produced at a fraction of the cost. UAS map products can be used to meet many science objectives, including to quantify geomorphic changes in coastal landscapes, classify landcover and geomorphic features in wetland and riparian landscapes, and assess habitat suitability. UASs can be equipped with multispectral cameras (cameras that capture images within specific ranges across the electromagnetic spectrum) and can be used to classify vegetation or identify invasive species. Other potential applications for UASs include inferring nearshore bathymetry from drone imagery of waves, measuring shallow bathymetry in streams and estuaries, measuring stream or inlet flow using image processing methods or UAS-mounted radar, and making thermal measurements to identify groundwater discharges. The AIM group at the Woods Hole Coastal and Marine Science Center currently  has five UAS pilots who are certified in accordance with U.S. Department of the Interior (DOI) policies. The center currently has three 3DR Solo quadcopter drones, and a Birds Eye View FireFly6 Pro fixed-wing UAS. Both UASs can be mounted with a Pentax Ricoh GRII natural-color, high-resolution, global shutter camera, a MicaSense Rededge3 multispectral wavelength camera, or a GoPro Hero 4 compact camera. Trimble Spectra Precision SP80 Global Navigation Satellite System receivers are used to precisely geolocate control points at survey areas. Images from drone flights are processed with Agisoft Photoscan software, and Pix4D processing software. With this equipment, the AIM group can survey a study area of approximately 0.5 to 1 square kilometer (160 acres) per day. Each multiplatform survey requires approximately five people to perform the survey efficiently, including two pilots, two survey crew, and a visual observer and data recorder. The USGS Woods Hole Coastal and Marine Science Center maintains an ongoing collaboration with scientists and UAS technicians at the USGS National Unmanned Aircraft Systems Project in Denver, Colorado; other institutions, including the Woods Hole Oceanographic Institution; and local UAS operators and contractors. Woods Hole pilots have assisted DOI’s Office of Aviation Services (OAS) in monitoring natural hazard emergencies and have been instructors for OAS-sponsored training classes. This networking and collaboration helps the AIM group remain current in a rapidly evolving technological field. 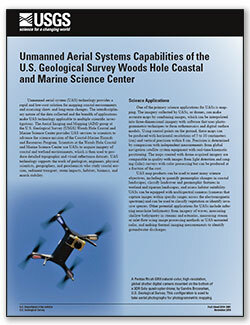 Brosnahan, Sandra; Sherwood, Christopher R.
Brosnahan, S., and Sherwood, C., 2018, Unmanned aerial systems capabilities of the U.S. Geological Survey Woods Hole Coastal and Marine Science Center: U.S. Geological Survey Fact Sheet 2018–3061, 2 p., https://doi.org/10.3133/fs20183061. Low-altitude (80-100 meters above ground level) digital images were obtained from a camera mounted on a 3DR Solo quadcopter, a small unmanned aerial system (UAS), in three locations along the Lake Ontario shoreline in New York during July 2017. These data were collected to document and monitor effects of high lake levels, including shoreline erosion, inundation, and property damage. This point cloud was derived from low-altitude aerial images collected from an unmanned aerial system (UAS) flown in the Cape Cod National Seashore on 1 March, 2016. The objective of the project was to evaluate the quality and cost of mapping from UAS images. The point cloud contains 434,096,824 unclassifed and unedited geolocated points. This data release includes the four sets of original aerial images; tables listing the image file names and locations; locations of the 140 transect points; and locations of the ground control points with photographs of the four in-place features and images showing the location of the two a posteriori points at two zoom levels. The U.S. Geological Survey worked in collaboration with members of the Marine Biological Laboratory and Woods Hole Analytics at Black Beach, in Falmouth, Massachusetts to explore scientific research demands on UAS technology for topographic and habitat mapping applications. Sandy Baldwin, Woods Hole Coastal and Marine Science Center, shares video from the kilauea volcano with Science Stroll participants. Sandy Brosnahan (left) and Ellizabeth Pendleton (right), Woods Hole Coastal and Marine Science Center Unmanned Aerial Systems (UAS) pilots flying drones at Sandy Neck Beach, Cape Cod, MA. Woods Hole Coastal and Marine Science Center Unmanned Aerial Systems (UAS) pilots Sandy Brosnahan (left) and Elizabeth Pendleton conduct a drone flight from atop a dune at Sandy Neck (Cape Cod). Does the USGS need flight approval to operate unmanned aircraft systems? What training do pilots of USGS unmanned aircraft systems receive? What does the USGS do with the information, pictures, and video collected by unmanned aircraft systems? All data are processed and used in support of mission-specific research objectives. The vast majority of the resource management and scientific data will be archived for long-term use and placed in the public domain. What restrictions are in place to protect citizens' civil liberties and privacy concerns related to unmanned aircraft systems? What are examples of projects in which the USGS has used unmanned aircraft? What types of unmanned aircraft systems does the USGS have? Why is USGS using unmanned aircraft systems? How does the USGS use unmanned aircraft systems?